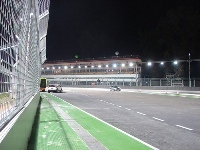 Come and experience the electrifying atmosphere of the Grand Prix as never before - at night! The world's first Formula One night race is hosted alongside Singapore's Marina Bay, offering walkabouts, musical entertainment and, of course, all the thrills of the world's most notorious racing event. The Grand Prix is a huge event on Singapore's calendar, described as 'Asia's biggest sporting and entertainment extravaganza'. Visitors can expect huge international stars to perform, and there are always massive parades to enjoy as well. The Marina Bay Street Circuit is unique in that in between turns 18 and 19 the cars race beneath a section of the grandstand giving spectators a wonderful thrill. It is considered a difficult circuit due to being bumpy and the 10th turn has been described by F1 legend Lewis Hamilton as 'the worst corner in F1'. The heat and humidity in Singapore is also hard on the drivers. The street circuit is fantastic for spectators though, situated in one of Singapore's most attractive areas and on the coast.